Thailand and Russia are reportedly considering a deal in which Bangkok buys Russian weapons in return for large quantities of Thai chicken. A Thai team is due to leave for Russia this weekend to discuss the proposal. Thailand has vast stockpiles of frozen poultry, and hopes to sell up to 250,000 tonnes to Russia, a government official told Reuters news agency. 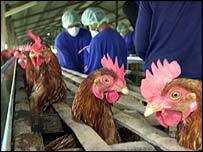 Before it was hit by bird flu last year, Thailand was one of the world's largest chicken exporters. Bangkok has been offering cheap credit to Asian nations willing to buy poultry that its largest customers, the European Union and Japan, have refused to take. Earlier this week, Thai Prime Minister Thaksin Shinawatra said he had ordered his ambassador in Moscow to offer chicken for weapons, and said he would consult military chiefs on what arms they wanted. He did not mention whether warplanes were likely to be on the list, but the official told Reuters that Bangkok was interested in Russia's Sukhoi Su-30 fighter planes. Most of Thailand's air force has traditionally been equipped with US fighters.